To get your cadence on strava, do you have to run with a phone? I hate runnign with a phone. No, any relatively recent garmin or tomtom will log cadence automatically. It's actually a pretty useful feature and in this case would definitely give some credibility. Oh man, rojo, I thought you were more up to speed on us hobby joggers! I'm sharing my HR, cadence, pace, and exact route from the single $250 device on my wrist and it syncs via Bluetooth to my cell phone which automatically uploads it to strava within a minute of finishing my run. The HR is sometimes wonky but the cadence is quite accurate and consistently recorded. Easy to spot the places I walk from the cadence data! You get it all on the Garmin 235 rojo. No strap for the heart rate either. Every one has been telling this tool to put one on for the last 70 pages. The info uploads either bluetooth or your computer. Miles, route, heart rate, cadence and elevation. I did find a camera at the interchange of Highways 94 & 67. But it looks like he's going to miss that one ... he'll transition to 67 a couple of miles before using a side road. The sneakiness! Just slipped right around those cameras. They're completely losing it. Which means the manipulations aren't working, the bullying attempts to stop legitimate questions through threats aren't working, the "for the children" isn't working, none of what they are doing to avoid simply uploading data and other reasonable requests that arose because of their own behavior are working. They ask why would someone do that? Narcissism. For attention, money, profit, and admiration. Why would someone claim they have a less than 31 minute 10k time and try to profit from that and all the other things he's tried to profit from? None of the people with legitimate concerns about this who care about the sport are profiting, are they? How did he fly to california from the united kingdom at his own expense and take all this time off "for the children" (then why not be quiet about the run if it's for children not yourself)? when he had a go fund me for his basic living expenses a year ago? How would that ever be a wise decision? My guess is someone else paid for the travel expenses. Did skinsGB and the other companies pay for his flights? Did one of the charities? And if it was a charity, how does that help them raise money as a charity? Will that latest bit of giving up his time and paying for his flights and now he is the poor persecuted lamb change and he will no longer have paid for his own flights? Will that be like the story changed where he decided one of the people who caught him not running when they came out to run with him as they were invited to do was a knife-wielding assailant with no threat or history of threat of that and no supporting evidence of that behavior from the person? Rural united states has so many ax murderers and they all come dressed as a runner with a headlamp, not as a bunny in the middle of the night, the bunny in the middle of the night is safe to stop for, not a runner with a headlamp. Also, since he is now complaining about being persecuted for being followed at night why did he display behavior that requires him to be followed and his story to be verified and why is he complaining when it is his choice to run at night? So why not run during the day? Or at night in front of the rv in headlamps for safety, that could also give them a dashcam of him running for the remainder, (doesn't explain the problems to this point they will need to account for, but is something). Simply have dashcam filming him in headlights, could even occasionally have all this frisbee golf playing crew pan down to speedometer, match to a worn-by-him gps with cadence. If you are choosing to run at night and are doing so 5-10 feet in front of an rv in headlights, your crew could get to you quickly if needed. They are losing it. They do want attention for a "record", they do want attention for money for sketchy charities, they don't want attention for the inconsistencies in what has happened and continues to happen. It's almost as if they are trying to say they are the ones who have the right to be angry for being caught. That isn't going to work. The more they say the less is answered and the more questions come up. They sound stressed. Would be so simple to provide legitimately requested information to answer questions that arose from their own behavior and stop that stress. Simple. No mileage should be accumulating if he isn't spotted running, no more slow rolling rv miles. I guess we now get to see how long he can stay awake and what pace he reaches and holds for the next weeks. Given the earlier claims on this run regarding his ability to hold a good pace unsuported for 35-40 miles through the desert and the same at altitude day after day after day shouldn't be too hard for him to stay awake and hold pace. Should be easy since he likes to stay awake for days and has said in the past he just needs 6 double espressos and 15 sugars to come back to life and start throwing down 5 minute miles for miles on end. Those nice boys asked me if I done knew any secret ways to drive to Effingham. The manager overheard them and got angry shouting what the hell do they have against my ham?!?! I told them it'd be best if theyall got right back in that lil camper they had and left. The Trans America Footrace that he won in 2015, was there any GPS data from it? Was it basically on honor system like what he is doing now? If that is the case, I will have to call BS on that one too. Probably same MO. It worked in 2015, why not try even faster time riding in RV in 2016? If anyone's bored, here's a good game to play: rather than get in touch with him or his crew beforehand to arrange things, let's sneak-up unannounced on Rob at 1am as he runs along a deserted road in the the middle of nowhere when for all he knows you could be some lazy-eyed psycho with a knife... Then we can all go home like good keyboard warriors and write how Rob got scared for his safety and sheltered in the safety of his support van - then forget to mention the full facts that when Rob realised once a safe time had passed and he was not in danger, he returned to where you stalked him and carried on running having had is rhythm interrupted and cost him time. Well played you absolute cretin. Trawling the Internet for recorded times for a 10k that Rob ran years ago (when you do not even know if he was racing that day or gently jogging around a course) and shouting about this on message boards implying he is 'too slow' to be recording his times when he runs 100k's on a daily basis, is like comparing a hamburger to a steak; sure they're both beef but that's where the similarity ends... Which if these keyboard warriors know half as much about running as they claim, then they would be aware of the difference... And going by the 'power of 10' rankings as your only source for Rob's times means very little - I have over 50 marathons and ultras to my name, but only 1 official half marathon which was pacing a slower runner, so a good hour off my natural pace and I have no official 10k time and I'm not sure I even have a 'power of 10' rating as I have never registered with the site as it is meaningless to me, so I guess I'm a fraud as well!.. And believe me, Rob has beaten me by at least an hour in every marathon we have been in together except for one, but to be fair he had just completed a 100 mile race in less than 24 hours before being driven 3 hours to the start of that marathon!.. So Rob is no slouch in 2 feet which anyone who has raced with him will tell you. It sounds like there's bitterness that Rob is on course to break the 30 year old record, not because of the fact he is in sight of achieving it, but by the dint of him not being born on the western side of the Atlantic Ocean... Rob has had the cojones to organise a support team and logistics, fly half way around the world and have a go at achieving something that no-one in a fine nation of millions could do over that time. Pure jealousy, pure spite and pure bitterness on behalf of these Wikipedia altering keyboard warriors who would struggle to match Rob's effort for even a day, let alone 40+. Ask yourself this all you keyboard warriors: why in the name of all that is holy would someone choose to, at their own financial and time expense, fly to California from London to drive across a continent at 5mph, mostly during the night, over the course of a month without rest, whilst running on a treadmill in the back of a Winnebago - Sounds absurd to the point of lunacy and the product of fevered imaginations doesn't it, but that's what you're accusing him of doing! go and take a hard look at yourselves you sad pack of numpties." I know Rob personally. During his first run across the US he had many individuals with him as well as the directors of the group. Rob is an outstanding and upstanding individual. During a race like this many times an individual hops into a motor home and then will be dropped back off at their previous day's end point. It is so very easy in this world to spread negative news and jump onto negative stories with negative opinions. Perhaps all of that energy could be used to do something good instead. I can speak for this man's character. He is an incredible individual. I would stick up for any friend if someone called them a cheat as well. I choose my friends carefully and I trust them." 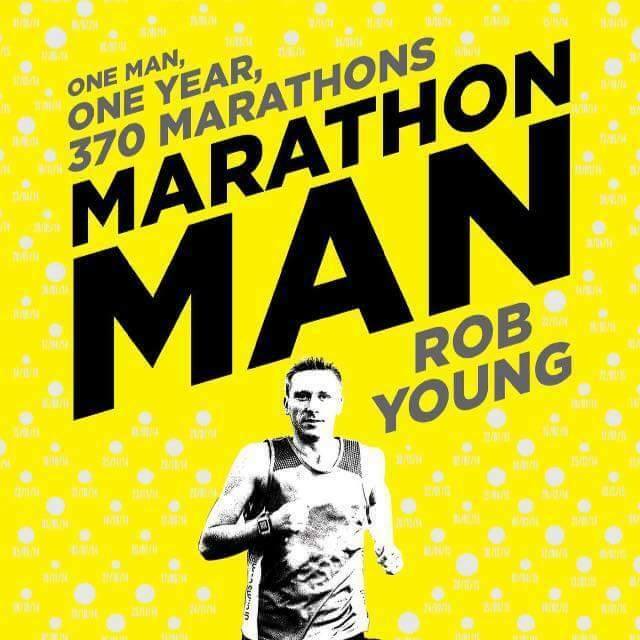 Marathon Man Rob Young's extraordinary feats of physical endurance and record breaking achievements continue after he became the first European to win the Race Across USA by a whopping 30 hours â€“ triumphing before race directors even had a chance to set up the finishing line. The 32-year-old was just too quick for the event organisers, running so fast on the last day of the competition that he had to wait for them to arrive so he could officially cross the line and finish. In light of what has happened, it seems like something really fishy happened in that 2015 run for him to arrive at the finish before even the judges drove there. I would be curious about that event as well (aka Race Across the USA or RAUSA). I recall there was some drama with runners who were part of the small "core team" leaving during the event on bad terms for some reason. I have no idea what it was about but might be worth a "marathon investigation." If there is one thing that Facebook has taught me is that there are a lot of people that can be brainwashed in this world because they have no ability to think. They intentionally delude themselves. Is it just me or is there a strange accusatory-while-pretending-to-be-nice tone to a lot of what is written about him? Not just you, I also see that accusatory tone in the writing from Sky for the TransAmerica 2015 race. It doesn't take a rocket scientist to see that there is something not quite right about getting to the finish line before the judges even have time to drive there. And there is not much media coverage of what happened during the race. On behalf of the citizens of Illinois, I would like to welcome Rob Young to our humble, honest, integrity filled state. If you have some time to run up to the Windy City, my buddy Rahm and I would like to give you the key to the city. We have no doubt that your efforts in your task are trustworthy and reliable. Just like the way we run this state! The Robert Young + Supporters method for setting a world record is genius really. 1. Say you're attempting a world record. Only provide circumstantial evidence. 2. Your supporters tell anyone who will listen that "since you are unable to do it, you can't criticize it"
3. By virtue of it being a world record attempt, i.e. something that has never been done at the same level before, no one can criticize you.